It is difficult to understand why you don’t see more of this plant. Quite apart from its wonderfully sonorous name, its a beautiful who’s flowers sparkle in the soft light of Autumn. Nipponanthemum nipponicum, the tautological Japanese flower from Japan. It is the only member of the genus and one of the most beautiful herbaceous plants in the garden at this time of year. In 1995 botanists and taxonomists decided that Chrysanthemums should be reclassified and renamed as Dendranthema, Leucanthemum, Tanacetum or Nipponanthemum. Although gardeners and nurserymen rarely understand the reasons for name changes they generally accept them with quiet resignation. But to change a name that was so intrinsic a part of the gardening lexicon (even if, in fact, few of us grew the plant) was a change too far. The new names were half-heartedly taken up in a few nursery catalogues but, by and large, were ignored, not least by the sellers of ‘’Mums’ on petrol-station forecourts. Eventually the international registration bodies realised that the name changes were not being used and reversed their decision. Unlike other Chrysanthemums the leaves of Nipponanthemum nipponicum are dark and glossy, almost leathery, which makes it an attractive plant even before it starts flowering. The foliage is so tough that it withstands harsh conditions and will even thrive in seaside gardens, revelling in the dry soil and hot sun. Flowers appear furtively during the cool days of September but you need to wait another month for the whole plant to erupt into a mass of radiant, white daisies each about two inches across. White flowers are few and far between in the autumn and those of the Nipponanthemum are such a pure, glistening white that they make this a plant to be treasured. There is a pink-flowered form, Nipponanthemum nipponicum roseum, but it is a dull pink and completely misses the point of this plant – which is to bring a sparkle into the garden in the gloomy days before winter. The white of the flowers is so clear and pure that it was used by the American horticulturalist, Luther Burbank, to produce the Shasta Daisy, Leucanthemum x superbum. At the beginning of the last century Burbank hybridised several Leucanthemum species but none of the resulting plants had the radiant white flowers he had dreamed of producing. Finally he pollinated his hybrids with Nipponanthemum nipponicum and produced flowers as white as the snow on California’s Mount Shasta. 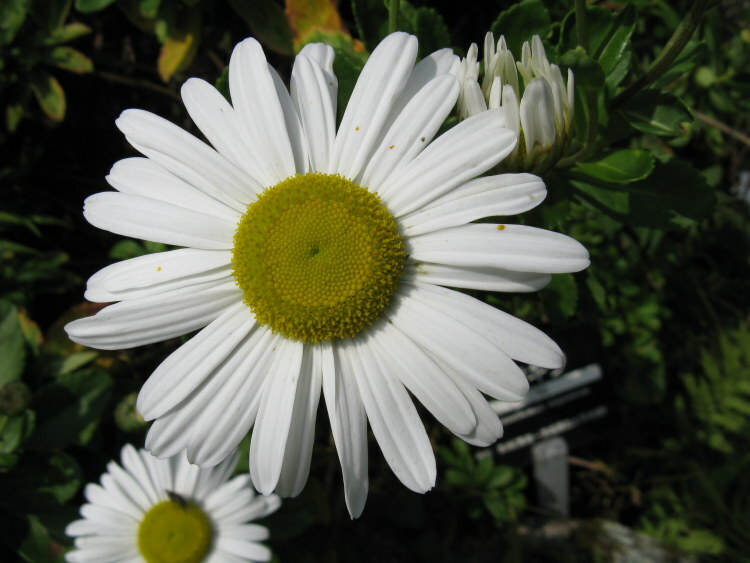 The popular white daisy that Burbank bred, Leucathemum x superbum ‘Alaska’, inherited all its brightness from its Japanese cousin, Nipponanthemum nipponicum. Nipponanthemum nipponicum is an easy plant to grow in a well-drained soil in full sun, although it will tolerate light shade. Although an herbaceous perennial it sometimes seems that it is trying to be a shrub, producing tough, woody stems. If the plant is not killed back to the ground during the winter it is best to cut it hard back in the spring, otherwise you will end up with a very gangly plant. Pinch out the tops of new growth when the stems get to about five inches long. Do this whenever you can until midsummer and by the autumn you will have a very compact plant that is smothered with daisies. Dead-heading will prolong the flowering. When the centre of the plant dies out, dig up the whole plant in Spring and divide it, replanting the vigorous parts immediately. You will need to do this every three or four years. It is very easy to produce more plants by taking cuttings at the end of the summer and over-wintering them in a cold-frame.